This level hike along an old freight road (the original road to Yellowstone) passes through riparian and forested habitats. The only elevation gain/loss happens as you drop down from the west lawn of Jackson Lake Lodge. From there the trail traverses below Lunch Tree Hill through a wetland area that is popular with moose, elk, and a variety of birds. However, the tall willows and other vegetation obscures the animals, decreasing the chance of seeing them from the trail. Eventually the road passes through stands of evergreen trees which adds variety to the hike and opportunities to see different species of plants and animals. The trail reaches an old bridge over Pilgrim Creek, which is nice turnaround spot. Optionally, you can continue on all the way to Colter Bay from here. There are two routes that take off at the junction just past the bridge. The northern route follows the dirt road past horse corrals for a 5.6mi/9km day. The southern route is more interesting as it passes Heron Pond for a 6.6mi/10.6km day. 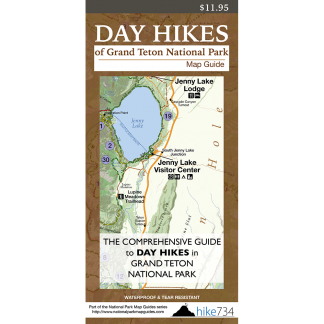 Both route options require arranging a vehicle shuttle from Colter Bay back to the lodge. Trailhead: Park in the Jackson Lake Lodge parking lot. 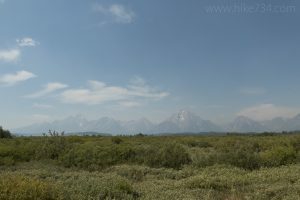 Head to the west side of the lodge overlooking Willow Flats and the Grand Teton range. The trail starts at the southern end of the lawn and heads down to the gravel road.